College dropout and aspiring artist Teal only wanted to live life without major complications. 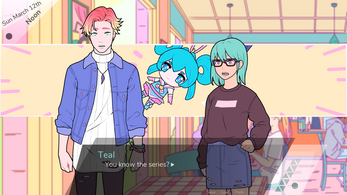 On top of that an almost tailor-made AI suddenly appeared inside their computer, claiming they'll tend to Teal's every need. And with a new co-worker who seems to be everything Teal aspired to be, the chaos is complete. Can Teal untangle the mess that their life has turned into, all while making enough money to not be evicted? This game was originally made for the 2017 NaNoRenO Game Jam. //TODO: today BESTEST CUPCAKE Poll! Devlog #30 - //TODO: today Release Getting Even Closer! how long does it take before you can save it? or does it just save automatically? Hi! You can save at any point in the game, just press the right mouse button or use the buttons below the text-box to enter the save menu. Hope that helps! can someone tell me how to get the "You Own!" achievement? If you didn't unlock it already, I think you have to do well at the bookstore. I'm not sure if you have to fail in joining the competition, but that's how I got it. Hi, sorry it took us so long to reply! Ewan already got it right but just to confirm, the competition does get prioritized so if you want the You Own achievement make sure you don't win it. First played this game in the 0.92 release, got busy and didn't check back till now. Really interesting story, and am glad to see it was finished. EDIT: Really glad the updates didn't break saves, really nice to start from where I left off. This is an absolute masterpiece; thank you for making it! I liked the idea about friendship with AI. Now what I disliked: not enough save slots. Normally I save a game each time when given choice. But your game presented much more choices than there were save slots avaiable. Please, make more save slots. I don't know what's better, that Phoenix was 10/10 willing to do it, or that it actually worked?! I was laughing so hard that I cried, truly masterful, thank you for making this. Let there be spoilers! Scroll past the second bolded username to skip my comment. I really like this game! The characters are written very charmingly, the art is top-notch, and the conflicts are presented in a way that feels very realistic. Also, the way Joyce encourages the player to keep at their art contest submission was actually effective enough that once I'd finished this part of the game, I ended up doing the work for the online course I'm taking that I'd been procrastinating on for about 12 days at that point. So good job on that! However, there were some things I noticed while playing that could potentially be improved or reworked for a better experience. PLEASE let me remap the mouse buttons (if possible within the engine). I keep accidentally right-clicking and opening the game menu and it gets pretty annoying after a while. The references to anime and manga kind of alienated me, as I have no interest in either of those. It would have been nice if, in the initial character creation, you got a choice of three sets of interests, possibly with sub-choices that indicate genre or the equivalent detail for each choice. Not extremely important, but it would have been appreciated. I kept wanting to go back and interact with the player character's friends in the MMO, but felt it would be wasting time I needed to spend on something else. Disregard this if that's intentional, but personally I didn't really like it. Surely the player character could find time to interact with two friends in a single section of the day? On the subject of choosing who to interact with, I actually might prefer ending up romantically with Joyce (presuming that is indeed one of the two romance options), but felt pushed by the game to interact more with Phoenix, sometimes even resulting in options that seemed unnecessarily conflicting to me. For example, when you get the option to call Phoenix and congratulate them for advancing to the next round or not. I played with route markers active and didn't really understand why "Don't call Phoenix" is an option increasing affection towards Joyce. Joyce suggested it, for Pete's sake. I would think they'd be happy I was paying due diligence to being a good friend, and more importantly, agreeing that their suggestion was best. However, this may be intentional as well, and if so, just take my feedback here as a sign that I'm suitably frustrated by the nuances of social interaction, haha. I agree with a comment here on the itch page for the game that the cliffhanger doesn't work as well if the player hasn't been emphasizing Joyce in social interactions. However, again, I think the game kind of actively discourages that, based on the player character being a bit of a grouch about this whole situation, and kind of indicating that they don't want to trust Joyce, which honestly is fair to an extent. Since the game encourages the player to fill their days away from Joyce as much as possible, I think a different path for the cliffhanger to take would be appropriate. Maybe have two versions of this argument, the current "I'm becoming part of your problem" version and a new "You don't need me anymore, you're coming out of your shell just fine" version, the game determining which one to show based on the player's actions, and in both versions, keep the player character's response of "You're the only thing keeping me leaving the house more than necessary". I've also considered that if this testing-a-domestic-AI situation were happening to me, my main concerns would be the ethical implications (of having what is effectively a person programmed to want to achieve a specific task and to prioritize that task over anything else they might want to do) and privacy (what kind of data does Bell Tech collect about me? What do they do with that data? I don't want my life to turn into another profit-generator for a multimillion-dollar company, so what would be my legal recourse to prevent that? Etc.). I think that if you ever consider another game in this same world, you may want to make a prequel following the development of Joyce, and have the player character be a person on the project (perhaps the project lead?) who has to grapple with these questions and find/implement answers that let them sleep at night while also not getting the project shut down because it won't be profitable enough. Bonus points from me if you insert an anticapitalist message! Anyway, that's my full report. Don't worry, I'm not expecting $100 for it. Thanks for making something so engrossing! I'll tip you for it when my finances recover a bit. Good luck with the second part! So! It's November 16, 2018, and Part 2 is out. I just finished playing, and I feel like it's time to update my report accordingly. It had been a while since I played, so I started my save file over. I kept all my options the same and, where last time I had both a female Joyce and Phoenix, this time Joyce was female and Phoenix was male. I like the character designs for both of them, by the way! I tell you what, I wasn't expecting to break into Bell Tech after that cliffhanger at the end of the first part. I mean, sure, we'd have to go after Joyce somehow, but B&E? It was exciting though! I loved the presentation bit, and I really appreciated the chance to approach Joyce's "rescue" as more of a "please come back because I care about you but you can stay if you want" conversation. This is really the direction I wanted to go in regards to "is Joyce a person and should she be respected as one". The anxiety about possibly getting caught kinda got to me. I half-expected something to happen, someone to end up arrested or questioned or something. I'm kind of glad you didn't do that (or at least, I didn't experience that), because that really would have put a dampener on things. Mostly alleviated if you allowed such a situation to be resolved by an impassioned argument for AI rights, but still. Talking about that whole scheme, I really liked Zen. He's fun! A bit pushy, but he makes up for it in being observant of stuff that the main character doesn't think of. Also, I loved that he's your other guild buddy. It kind of resolved my earlier point about wanting to spend more time with the guild-- in my head, this means that Zen can keep the main character and the guild in touch with each other when the MC can't be online. The competition was tense too! The timer was a really good way to keep me from looking up the answers. I got some questions wrong, but not enough to stop me from landing that job (hooray)! I did feel bad that Phoenix didn't get it though-- kind of in the same vein as my ideal resolution to legal trouble with Bell Tech, I was hoping that, miraculously, the judges wouldn't be able to decide between us, and would give us both jobs and maybe split the money among us. That may be possible (I won't know unless I look it up as I tend to go one route on things like this and look other routes up if I really want to know), but it's not the version I got. Now, talking about romance. I warmed up a lot more to Phoenix this time around. Really, I think it started in the second part, with him opening up to the MC about his insecurities. What can I say, when somebody opens up to me, they get brownie points. I ended up romancing Phoenix in this run, though not due to conscious choice. When the confession scene happened, I said to myself, "There's no realistic way I can say no here. He's cute, he's charming, he's funny. But I'd really like if saying yes to him didn't necessarily mean saying no to Joyce, if I've even given her enough affection to get there with her." (I guess I'm a real have-your-cake-and-eat-it kind of player, huh?) Again, this may be possible, but I certainly didn't see it. Related to one of my first report points though-- I still feel like the game pushes you towards Phoenix. I found myself wishing I could spend more time with Joyce (as well as the Titan guild), but still enjoying my time with Phoenix. I don't really ever want to turn down an offer of his, but spending time with him means I can't spend it with Joyce. (Note on that: the first time he calls you, if you agree to meet with him, you automatically go for a walk. I didn't like that. I said yes to going out tomorrow so I could stay inside and play video games today, Joyce! Anyway.) 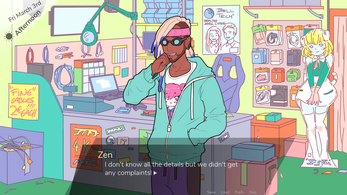 I'd love to see a polyamorous route with both of them (hell, if Zen wants to get in on that action, I'm down for that too) but the game seems like it has an overarching theme of "you can't do everything all at once", which that may not gel well with. Maybe think about it, though. Again, assuming it's not there already and I just missed it. The epilogue with Phoenix is cute though! Very glad it's not just a "everything is perfect, happily ever after" ending too, that the MC talks about the ways they don't quite (and just plain don't) match up, because in my own very limited experience with relationships, that happens. And yes, Joyce becoming a citizen and having her own life (while still being very much your roommate and friend) is really great too. AI rights! I think that's all I have to add. This is a wonderful game, and it's clear you worked hard on it! It definitely paid off. Thank you! I'll definitely keep following y'all to see if you make anything else like this in future, and best of luck with your current projects too! Don't read if you don't know the plot, otherwise you're ruin your fun of discovering it by yourself. Well i'ts been long time since I finished the demo. I really enjoyed. And even wrote comment here. But now it's time to play the full version <3 .I'm sure it was worth waiting. Artstyle... Yeah, the artstyle is great. Λ Ξ Ｓ Ｔ Ｈ Ξ Ｔ Ｉ Ｃ color scheme and style. Amazing sprites. A few great CGs. Minimalistic GUI and artstic menus. Plus very good backgrounds and sountrack. Characters are lovely too. Every at least a bit important for the plot character has his own well-done sprite. Some of them (MC and love interests) even two sets of them (for both "sexes"). I like also that face expressions are not static (in many other VNs they are). Plus all the characters are well written, intersting and they have their own personalities and styles (compatible with the general style of the game of course). Plot is very original, full of intersting events, plot-twists and a lot of (usually) meaningful choices. Plus each romance option has their own events and endings. I'm sure that a lot people appreciate thet you allowed player to choose "gender" of MC and love interests. Plus we can choose pronouns and name. Only two love interst? Yes, only two. But they are great and I think it's enough (at least devs could more focus on each of them). In both routes I chose not giving up, focusing on art content and spending a lot of time with the love interest! Plus in both cases I took part in the AI experiment. Next days were harder... for Teal... Loneliness, sadness and emptiness. But good guy Zen gave us new hope! His plan sounded a little bit risky but Having Joyce back is worth it. I'm glad Phoenix helped, too. The rescue mission part was great. Teal won but it's not as important as events of the next day. T and J finally told each other how the feel. Artifal person but real love! yay! Happy end, yay! Phoenix route... Well she's new in town, working in the same place. She's quiet but friendly. And she likes art, too. She's very intersting person. Especially if player chose to befriend early in the story. Spending more time together gives a good opportunity to get closer to her. And this time I tried to not get attached to Joyce and more focused on spending as much time as I could with Phoenix. yeah, this time I tried to treat J like just part of the experiment I took part to get paid. So after vanishing of Joyce, I was only like ":(". Well, I finished J route 1st so it was hard to just left her behind, but I decided to not rescue her, this time. And indeed it was hard to just let her and live with awareness of it. Next days! Visiting P, conversation about her backstory, tea. Later Phoenix became our rival in finals of the art content, again xD. And Teal won, again xD. Sorry for a lot of summarazing of plot but that's how I like to tell how I feel about very good and long VNs. Found bug: Phoenix's 1st day, 1st client arrived, T is talking (with P) about him but her sprite is not in uniform at these 3 textboxes. We're really happy that you enjoyed our game and that you liked Phoenix's ending! I don't mean to be that guy, but did I pick up on some JoJo references?? A few important question: How do you personally imagine the Joyces' voices to sound like IRL? Can their voices be based off of anyone? Also would Joyce be into Kpop (LOL)? Questions aside, YOU GUYS oh my god - I didn't even know part 2 was released just recently!! I remember playing last year, and this game quickly meant so much to me (I have a love-hate relationship with the Defragment track, DEPRESSING AF THANKS). There were times that I really had to take a pause from the game just because of how real it got, but part of the struggle is to face it head on so I can appreciate how awesome it is! I really do love everything- this game is so incredibly put together. Amazing job, BL+!!! Thank you for hard work!! Admittedly, while I eventually stopped keeping track of the Devlogs, I occasionally replayed the first part (and repeatedly suffered from abandonment issues, J o y c e). And now during a time that //TODO is more relevant to me than ever, it's been updated to completion!!! Man do I love a good (or any, actually) excuse to replay one of my favorite games. This was such a delight to discover during last year's NaNoRenO - I was HELLA impressed seeing such a meaningful and quality game made within a fricking month! I really wish you guys the best of luck in all your future endeavors!! I look forward to seeing more from both the team and the staff! We really appreciate the good luck and we hope you'll like our future projects as well! Randomly found this game, the art and the fact that you can be gay got me. Such a sweet visual novel! Thank you for making it free to play, I donated a little because I hope to see more work from you. Much love, an aspiring game developer. Thank you so much! Early on we considered selling the full version but as time passed we decided against it since it was ultimately a passion project and we figured more people would be able to play it if it was free. So thanks for still donating a little! Now that we try to make this our job every little bit helps. We're glad you enjoyed the game and we wish you good luck with making games yourself! One thing i'd like to mention is the title of your game. I went to look for it on itchio and, couldn't find it for the life of me. The // messes up trying to find it easily. Not sure if you are aware of that and, I know as, long as this game has been out what's done is done. Just a shame as this was well put together! Sorry for the late reply! First of all thanks for making a let's play, we really appreciate that! And yeah, we are aware that the title isn't exactly easy to find (even aside from the //). But as you said, what's done is done. We're happy you think it's well put together and we hope you'll enjoy the rest of the game! Hi! If you downloaded the game directly, you can just replace the files of the previous installation with the new version. Save files are stored elsewhere so they won't be overwritten by that. We hope that helps! No worries! We're glad it's working now! Hi! Sorry you're having trouble with the download! Did you have any other network problems or we're you able to download other games on itch.io before? First time I've got problems!! We're glad it worked now! Have fun with the game! Thank you! We're glad that it was worth the wait for you and that you enjoyed the game! Thank you! We're happy you enjoyed the game! And there is a way to get together with Joyce. The easiest option is to turn on the route help in the settings to see indicators which choices are for which route, but you can also just try to spend as much time with Joyce as possible and try to keep some distance to Phoenix (even though you can still be friendly with them). Part 2 was amazing! I loved the ending with Phoenix. Teal's speech about finding new dreams really hit home for me; their story and Phoenix's story really resonates with anyone who's ever worried that they wasted time while pursuing their passions. I didn't play the other routes, but I love the message that there's a lot of paths you can take in life, and they'll all work out some way or another. Teal finds happiness regardless of what career path they go down. I enjoyed following Teal as they found themselves and learned to take care of their mental health :). The drawings of Teal/Phoenix at the end, and the party at the bookstore, were so adorable! Loved the background music in Phoenix's scenes. Also, the interactions between Teal and Snow were so precious; I'm excited to see more of Snow in Defaction! Thank you guys for all your hard work; this is an absolute masterpiece!! I'm so happy to have been able to witness this game's development since its beginning. Excited to see what you make in the future. I'm so happy I got to play the second half! It had been so long since I played this game (I went to the first page of comments and apparently, mine was made a year ago). I actually forgot what happened/what I had done on each of my save files, so I just decided to restart the first half as well. I related even more this time playing. I'm in my senior year of high school now (I know, I'm young), and I'm expected to know what I plan to pursue as a career. I was thinking of doing independent illustration but I'm not sure I have what it takes. Most days, I don't even have the motivation to create anything. And it doesn't help that I'm in an art school surrounded by people who have way more technical skill than me. I'm supposed to submit college applications in a month or two and I can't help but wonder if the debt is worth it. Well, just know that I really enjoyed this game. It really resonated with me. Also, I think I noticed a reference to Defaction while working in the bookstore? Thank you so much for your comment! We're really happy you enjoyed the game and that it resonated with you and we wish you all the best with your decision! It's definitely not easy, which is one of the reasons why we tried to put some of our thoughts on things like dreams, jobs, and the future into the game. We hope it helped a little but even if a lot of it comes from experience, there's no definite answer that fits all. And yes! There is a Defaction reference in there! We tried to keep it a little obscure so we're glad you still spotted it! Just finished part 2, spent 50 percent of time crying and other 50 percent laughing. It surely IS worth the wait! One of the best visual novels I've played, thank you so much for it! Love this, written well and looks gorgeous can't wait to finish it. Thank you so much for making a let's play of our game! We're glad you like it so far and we hope you'll enjoy the rest too! I love this game! Every thing about it was done perfectly and for me it was very relatable. I'm glad you could make the 2nd part happen and I wish you good luck for next game development (or whatever else you are doing). Also I'm very thankful for the Linux version (I believe no problem with RenPy) and for acknowledging the LGBTQ+ community. For me full 5 stars and also inclusion in my new collection "Games, that will stay in my heart" (few games are actually in there, only virtually (like Undertale, ...)). Hmmm. Is this a JoJo reference I spy? Just finished part 2 and I felt thoroughly satisfied. Thank you to the dev team for sticking with this project and giving us such a special game. [spoiler] The Phoenix route was great. Lots of natural feeling intimate moments, nothing felt too rushed and then that sweet sweet happy ending. We're really happy that you were satisfied with the ending! And we're glad that you liked the Phoenix route! it's so good?????? also i love the art in bell tech, especially joyce's cg!!! i got most of the achievements already [need pro guild, worker bee, cold hearted and completionist] and i'm!!!! also just WOAH at the art!!!! also i want to steal joyce's outfit. both of them. also pheonix's but without the jeans. did i mention how nice the character designs are because!!! woah!!!!!!! 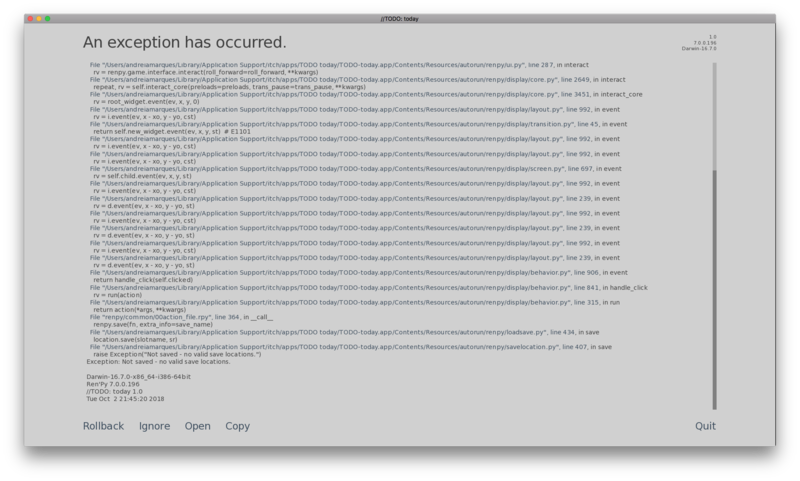 oh, and there was a bug i encountered? i didn't take a screenshot of it, but i rememeber it happens if you're in pheonix's route and are in their room. i don't think i made a choice or anything, it just happens when you go to the next dialouge. ren'py says there's a bug, but i can play as normal after. OH and!!!!! the endings!!! are so good and the wait was so worth it!!!!! i support joyce and pheonix so much!!!!!!!!! just!!!!! they're both doing good and i'm proud of them, weirdly enough!!!! oh, and joyce in the end credits when taking pheonix's or the protagonist route is a nice touch!! that's all i had to say!!! thank you so much for making this game!!!! good luck in your next projects!!! Aaaah thank you so much for writing this comment!! And for all the kind words! We're glad that you enjoyed the game and that the wait was worth it for you! Also, we weren't sure how many people would get the situation with the double confession but now we're definitely glad that we put it in there! Thank you for all the hard work you put into this series until the very end! We're happy you enjoyed the full game! And reading all these kind comments definitely makes all the work worth it. Oh no! Well, we didn't want the rescue to be too easy but we hope you'll get the other endings as well. oooo i cant wait to download it! Is the game still getting released today? Hi, thanks for your interest! We unfortunately ran into some unexpected delays with some of the final assets but we are now working towards a release tomorrow. We're sorry that we couldn't finish it today but we are almost there now! Sorry it took us a bit longer, but we hope you'll enjoy the full game!